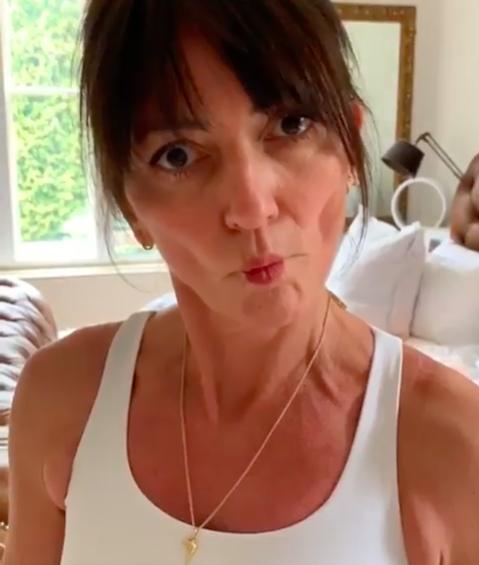 Davina McCall has seemingly hit back at her haters in a hilarious new post on Instagram. The 51-year-old was joined by her BFF Chessie King as they stripped down to their underwear and danced around for an ‘I don’t care what they think about me’ video. In the clip, fitness enthusiast Davina can be seen showing off her rock hard abs as she jumped up and down on a bed enthusiastically. Later on in the wacky video, the former Big Brother host shows off her best dancing moves as she chants the lyrics, “I don’t care what you think about me” before the pair ended up in fits of giggles. The mum-of-three – who shares Holly, 17, Tilly, 15, and Chester, 12, with ex Matthew Robertson – then went on to explain the inspiration behind the post. Speaking about her pal Chessie, the star continued, “She’s been inspiring my girls and all of their friends for an age and thanks to them… we are hanging out this avo . This comes after fans rallied around Davina when she admitted she was too ‘embarrassed’ to discuss a painful injury, which has forced her to reassess her strict exercise regime. Admitting she didn’t feel like she could be honest because she’s known as the “exercise lady”, the star shared a very candid post on Instagram to explain why she hadn’t been sharing so much of her training. We hope you’re on the mend, Davina!